Valiant has a number of first issue launches this month! 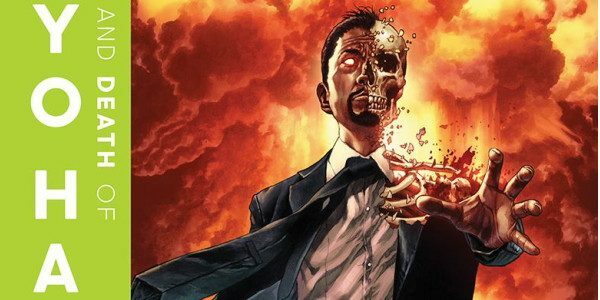 One of them is Toyo Harada #1, written by Joshua Dysart, with art by Cafu and Mico Suayan, and colours by Andrew Dalhouse. 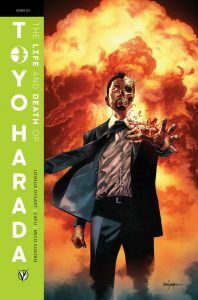 The Life and Death of Toyo Harada, chapter 1, The Spark, centers around the WWII nuclear bombing of Hiroshima Japan by the US. But mostly what happens next. Amid the destruction of the bomb’s effects, young Toyo Harada sets out to rebuild himself. He has survived the nuclear fallout and finds that he now has superpowers. He begins to activate other ‘psiots’, that is, those others with latent telekinetic powers. And as he becomes a man, he builds a financial empire. Harada recruits psiots to work for his Harbinger Foundation, an enormously well funded clandestine organization that recruits and trains psiots for missions. There ya have it; the capsule. Now, how is the comic? It’s actually thrilling. The pace is constant. It’s a mix of horror, supernatural, monsters, and sci-fi. The visuals are realistic, and there is a constant feeling of tension and conflict throughout. Figures are well drawn, expressions are great. Colouring is high-end realism, giving the book a richly realized look. It’s the start of an interesting take on supervillianry!